As snippets and stories circulate, it is of the utmost importance that we all refer to the most credible of news sources, and equip ourselves as trail runners to know how best to support firefighting efforts, and reduce our own risk on the trails of South Africa. We spoke to well-known Cape Town photographer, Justin Sullivan, for some insight in to his front-of-line imagery which takes us all in to the catastrophic heart of a blaze. Patrick Ryan of Vulcan Wildfire Management emphasises the importance of referring to reliable sources when assessing risk, supporting firefighting efforts and communicating the progress of wildfires. His company specialises in Wildfire Risk Consulting as well as Wildfire Investigations, and his advice for following Wildfire stories is to refer to the Twitter feed of the Volunteer Wildfire Services. 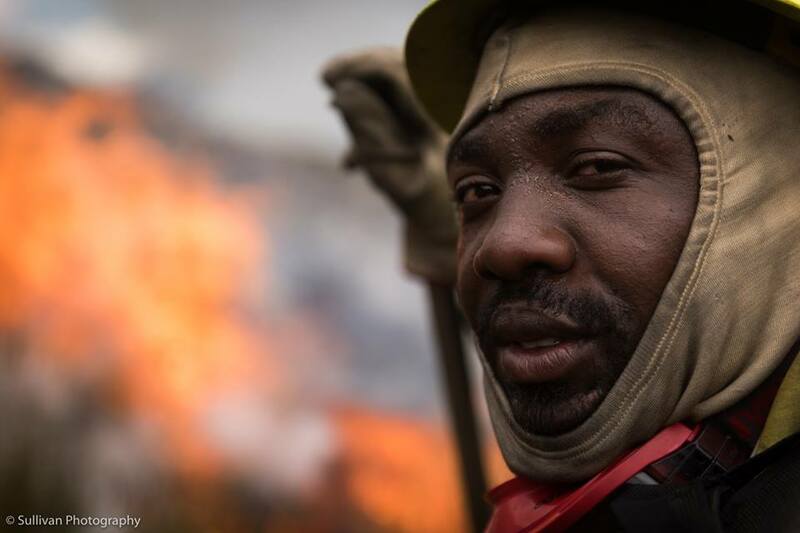 The Volunteer Wildfire Services (VWS) has been combating dangerous and sometimes deadly runaway wildfires since its baptism during the devastating 1999/2000 fires in Cape Town. With over 200 volunteer members at four stations (Newlands, Jonkershoek, South Peninsula and the newly developing Grabouw Station), VWS is a highly-organised Non-Profit Organisation, run and managed by a team of volunteers as well as a recently employed General Manager. Patrick has seen trail runners getting dangerously close to wildfires, unaware of the speed at which fires move, and the danger of a small change in wind direction. What should you do if you are out on the trails and spot a fire? "The first thing to do is phone for help or alert authorities to your location, do not panic but stay calm and think clearly about what actions you will take to get to safety. Put the phone numbers for each District’s fire services into your phone with a heading like Emergency so you can easily find it, e.g. Emergency Fire Overberg. Wildfires can move a lot quicker than people understand and when you combine the elements of terrain (slopes, gullies, ridge lines etc) and wind they can move dramatically quickly, often quicker than someone can run. For example, for every 10˚ of slope the fire will double in speed. "For this reason never run away from a wildfire uphill, move sideways and downhill as soon as possible and stay on the path if you can. Moving off trail is much slower. Move with haste but still carefully, you don’t want to trip and injure yourself. Move in a direction that is against the wind as fire will move slower against the wind. If unable to get down the mountain look for natural breaks in vegetation that might be a safety zone — such as cleared or rocky areas, these need to be at least 8 x the height of the flames in size to be safe. If it is possible, clear as much vegetation from the area and use natural barriers like large rock outcrops or boulders to shield you from the radiant heat. If caught in smoke, get down low on the ground and take shallow breaths through material if you can. If possible dig a small hole and put your face into it as the lower you are, the more chance of cleaner air. Remember that most sports clothing is made of synthetic materials and will not protect you against the heat of a wildfire, it may even burn onto or melt on your skin, so rather discard as much as possible if sheltering in a safety zone." On the problem of misinformation that occurs from social media, please follow the following organisations’ social media platforms. They are proactive and go to great lengths to provide accurate information on a wildfire occurring within their area. Sharing the wrong information can be very dangerous during an emergency incident. It can cause people to evacuate needlessly which may put them in a greater danger or get in the way of the emergency services. It can also cause panic and the correct information is lost in the ‘drama’ of all the fake news. Nine deaths were reported as wildfires spread across Rheenendal, Knysna, in October 2018. The Sunday Times reported that a family lost seven members, including a pregnant woman and five children. The Garden Route fires spread across the southwestern Cape, raging through George and Tsitsikamma. About 2,000 people were displaced and more than 92,000ha of vegetation destroyed. This is not a scenario that is unique to the Western Cape regions. And what of Lion’s Head after the blaze of 27 January? SanParks Statement: “Table Mountain National Park will continue with mop up operations today the 28th January 2019 to ensure the fire that started on the 27th January 2019 does not flare up again. Firefighters will be active in the area for the next few days. We ask the public and all recreational users to remain out of the area whilst this occurs. Signal Hill Road remains closed. This is a city road and the City will announce through their channels when the road will reopen. The Fire has impacted the Lion's Head maintenance work which is currently underway. This project will only be able to resume once the park has confirmation from the Fire Incident Commander that the area is safe to access. Infrastructure on Lion's Head has been damaged and this will delay the reopening of Lion's Head. The reopening was originally scheduled for the 15th of February 2019. As yet the park is unable to determine a new date for the reopening of Lion's Head. Remember, people's lives, houses, livelihoods can be on the line during these times, so stay well clear until the green light is given. Equip yourself with emergency numbers, and be particularly cautious during fire season in your area. Remove problematic litter, alien vegetation and never start a recreational fire in an environmentally sensitive area. It goes without saying that cigarette butts should never be tossed to the ground, and the release of fireworks and (unnecessary) flares can put you on the wrong side of the law, so simply abstain. Imagery was supplied by Justin Sullivan at no cost to Wildrunner, but with an agreed R500 donation to VWS by editor, Kim Stephens. We urge our trail running community to make a donation to this incredibly worthy cause, and ensure that their work continues in the face of growing adversary. SMS vws and your name to 41006 to donate R25.